Splashbacks are large surfaces - and can be a real opportunity to add some colour to your kitchen. Image by Stegbar. A splashback is a protective surface on your kitchen wall, designed to protect it from water, greasy marks and splatters. Splashbacks perform a fairly basic task, but can make a big difference to the look of your kitchen. Identifying the right splashback for your kitchen will involve a bit of thought about your budget, and the style of kitchen you're building. Budget - what do different splashbacks cost? First, you need to establish what your budget is. 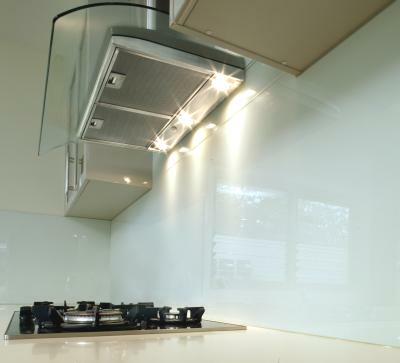 Stainless steel and glass are expensive materials, and will cost big dollars - particularly if you're planning on installing a large splashback. Acrylic is generally cheaper, and tiles can be made to suit the largest or smallest budget. Will your splashback have a mosaic or pattern designed in? Do you require powerpoints? And are you able to get away with a standard (i.e. pre-cut) sized splashback? Many types of splashbacks - particularly those in a single piece like acrylic, stone or glass - will need to be custom-made with electricity point cut-outs built in, which will add to your costs. Once you’ve worked out your budget, it’s time to decide on what works best aesthetically. Timber, glass and stainless steel will work with any benchtop. Stone or synthetic benchtops in particular look best with similar splashback materials. Colour has been a major part of kitchen design for many years now. Taking this further, it's often suggested by retail experts that many homeowners are even buying appliances based on the colour or look of the splashback. You may believe this is taking things too far, particularly if you are on a budget; however colour may just be your thing. Glass splashbacks are particularly colour friendly. The two most common colouring techniques are ceramic frit and two-pack urethane. For the former, ceramic paint is screen printed onto the glass and then baked on during the toughening process. Urethane treatments are usually spray-painted onto pre-toughened glass and then either air dried or baked on. Ceramic frit has colour limitations and the finish might be less than 100% opaque. It's also quite expensive. Applied-paint processors are less costly and use a wider colour range. A more modern alternative is Spectraglass, which also brings costs down, due to its reliance on computer controlled paint guns in a production-line environment. Obviously, tiles offer a formidable amount of scope for decoration and colour too. Tiles can be used to tremendous aesthetic effect, regardless of materials used elsewhere in the kitchen. Each splashback has different maintenance requirements; that being said, most can be wiped down with a damp cloth to remove streaks, oil and general mess. Some surfaces may require proper cleaning agents or care. Timber in particular requires special attention to ensure that it remains properly sealed against moisture. Some surfaces, like glass and stainless steel, will 'attract' fingerprints and smudges more easily than others. By the same token, however, grouting for tiles needs to be cleaned regularly to prevent mould and mildew. Practically, you also need to take into account the height of the splashback. The minimum splashback height is 450mm from the bench surface. If you are installing with an electric cooktop in mind, then the minimum height of the rangehood above an electric cooktop is 600mm (as is the height of wall unit cabinets).